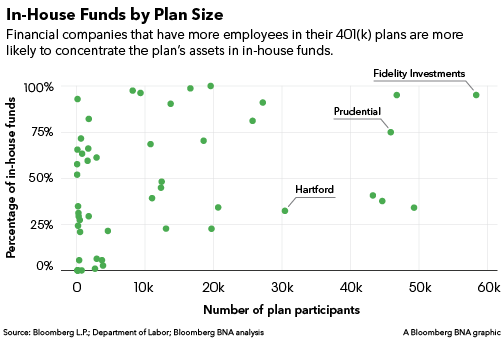 If your employer’s 401(k) plan is full of mutual funds, you’re not alone: the companies that issue those mutual funds put them in their 401(k) plans, too. But this long-standing practice may be about to change. A new wave of litigation is targeting companies that put their own investment products in their workers’ 401(k) plans. Companies like Morgan Stanley, Wells Fargo, Charles Schwab and JPMorgan are accused of profiting at their employees’ expense by stuffing their 401(k) plans full of poorly performing funds that earn big fees for the company. At least 19 financial companies have been sued over this practice since 2015, and the companies haven’t been faring well. Seven judges have given early wins to the investors, allowing cases to proceed against Putnam Investments, Deutsche Bank, Franklin Templeton, American Century and others. With nearly 20 of the biggest names in the mutual fund business under fire for this practice, should other companies be worried about winding up in court over their retirement plans? To answer this question, Bloomberg BNA analyzed government filings for the 401(k) plans of 100 companies involved in the issuance of mutual funds and investment products. Bloomberg BNA looked at data from 2015, the most recent year for which most large 401(k) plans have filed annual reports with the Department of Labor. Nearly every financial company studied by Bloomberg BNA—92 out of 100—had some portion of its 401(k) assets invested in funds affiliated with the company. Those that didn’t invest in in-house funds tended to be smaller plans with fewer participants, with one glaring exception: the $11.4 billion plan of Citigroup Inc., which removed nearly all its affiliated funds in 2007, shortly before facing a class action over this practice. That lawsuit remains pending. About half of the companies studied had a significant percentage of plan assets—more than 50 percent—invested in in-house funds. And 20 of the 100 companies carried more than 90 percent of their 401(k) assets in funds connected to the sponsoring company. 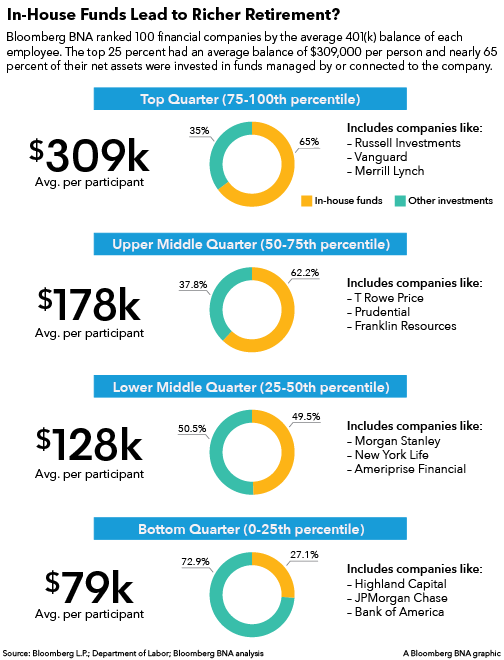 This final universe of companies includes industry giants such as Vanguard, T. Rowe Price, Fidelity and MetLife—which all have more than $1 billion in their 401(k) plans—along with smaller companies such as Gamco Investors, Harbor Capital and Waddell & Reed. Despite the ubiquity of this practice, a few companies recently took steps to reduce or eliminate the in-house funds in their 401(k) plans. Atlanta-based Ridgeworth Capital Management LLC removed all in-house funds from its $13 million plan in 2015, according to government filings. Payden & Rygel in Los Angeles also dumped the in-house funds in its $49 million retirement plan in 2015, government filings indicate. Representatives of Ridgeworth and Payden & Rygel declined to be interviewed for this article. With the specter of expensive litigation surrounding virtually every financial company with a 401(k) plan, the smart move may be to purge the plan of in-house funds altogether. After all, just being sued can be an expensive proposition: a white paper from insurance broker Lockton Cos. suggests that defending a class action over 401(k) plan fees through the motion-to-dismiss stage can cost a company between $500,000 and $750,000. Despite this litigation risk, removing in-house funds could be bad for business, according to one employee benefits attorney interviewed by Bloomberg BNA. “Would it look good for Fidelity to have Vanguard funds offered to their participants? No, because then everybody would say they don’t trust their own funds since they don’t even offer them to their own employees,” said Ary Rosenbaum of Rosenbaum Law Firm P.C. in Garden City, N.Y. Even so, a company that puts a disproportionate share of its own investment products in its 401(k) plan should think twice about whether it’s used an objective process for choosing investments, said Carl F. Engstrom, an employee benefits litigator who represents the investors suing Deutsche Bank, Allianz and American Century, among others. That’s because a 401(k) plan fiduciary should be looking for the best investment options for the plan’s participants and not merely asking whether in-house funds are a good fit, said Engstrom, who is with Nichols Kaster in Minneapolis. What About Those Big Balances? Despite the questionable optics and potential for self-dealing, there may be benefits associated with this practice. 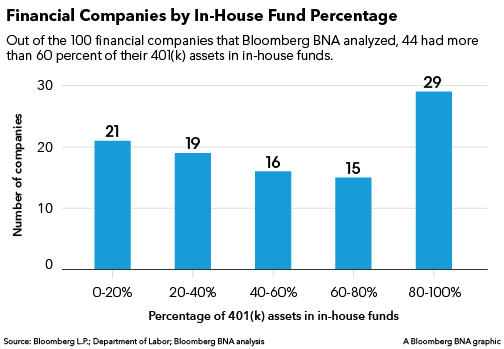 Bloomberg BNA’s analysis found that financial companies with a larger percentage of 401(k) assets in in-house funds also tended to have higher average 401(k) account balances. Those with more than two-thirds of their 401(k) assets in in-house funds had average account balances of more than $300,000. Companies with less than a quarter of 401(k) assets in in-house funds had average account balances of only $78,000. Across all industries, the average 401(k) account balance is $92,500, according to a recent report from Fidelity. Does this mean that more in-house funds can lead to a heftier retirement account? Perhaps not. Engstrom said he’s seen no evidence that having more in-house funds in a financial company’s 401(k) plan leads to bigger average account balances. Rather, the higher balances are largely explained by higher average incomes and lower employee turnover, Engstrom said. “Proprietary fund usage is highest among mutual fund companies, and mutual fund companies tend to have the highest average income levels among financial companies, because they don’t have as many service-level employees as you might see at a multinational bank,” Engstrom said. The early successes of this litigation push—Engstrom’s firm alone has a perfect 5-0 record in defeating motions to dismiss—is no doubt cause for alarm at the 92 percent of financial companies with in-house funds in their plans. But it also provides guidance for companies hoping to avoid litigation in the future. 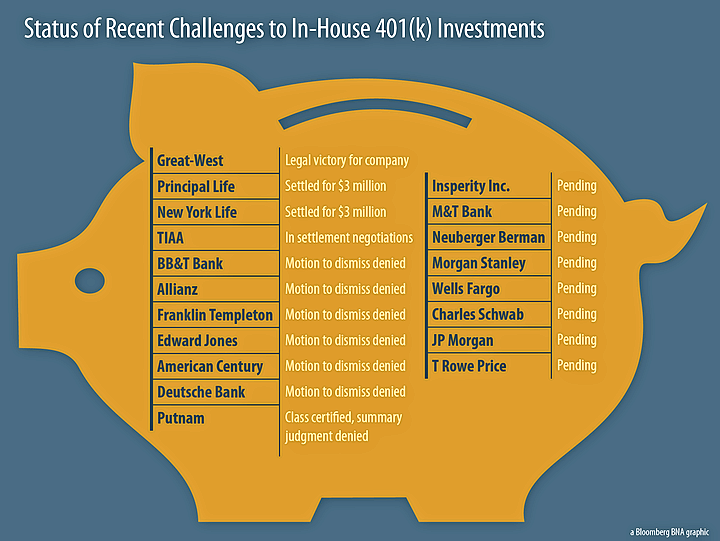 For one, companies should be wary of offering in-house funds that have few other investors outside the 401(k) plan. Lawsuits against Allianz and Putnam have attacked this practice as a risky way to provide “seed money” for new investment funds at the expense of workers’ retirement savings. Several lawsuits take aim at high-fee proprietary index funds. Because index funds are designed to track a specified universe of investments, the main factor distinguishing one company’s index fund from another is arguably cost. Offering in-house index funds that carry fees significantly higher than the competition has driven litigation against Deutsche Bank, American Airlines, New York Life and Charles Schwab. Another red flag arises when companies offer their own mutual funds to the exclusion of all competitor funds. Lawsuits against Putnam, Franklin Templeton and T. Rowe Price claim that this practice hurts employees’ retirement savings. Finally, several lawsuits cry foul at 401(k) plans that offer in-house funds not offered by any other large retirement plan. Deutsche Bank, M&T Bank and New York Life have faced legal claims based on this alleged practice. The litigation push against financial company 401(k) plans began in earnest in 2015, and it’s too soon to tell what effect these lawsuits will have on the industry in general. However, some early signs indicate that companies may be responding by giving employees more choices and attempting to lower fees. Putnam Investments, which was sued over the in-house funds in its 401(k) plan in 2015, added six nonaffiliated funds to its plan in early 2016, according to government filings. New York Life, which settled a lawsuit over its in-house funds for $3 million earlier this year, swapped its proprietary MainStay S&P 500 Index Fund with a comparable Vanguard index fund with lower fees, government filings indicate. The change was effective July 19, 2016—one day after the company was sued over its in-house funds. More broadly, 401(k) plan fees have been trending downward ever since the first wave of litigation hit the industry more than a decade ago. The average fees paid by 401(k) mutual fund investors declined by 31 percent between 2000 and 2015, according to research by the Investment Company Institute. Engstrom, the employee-side litigator with Nichols Kaster, sees this as great news. “Because of the critical role that low expenses plays in retirement outcomes, excess fees in individual instances are part of a broader problem in which participants in defined contribution plans have worse outcomes than participants in defined benefit plans,” Engstrom said.